All aboard! Creative tips to decorate a baby nursery or boy’s bedroom with Thomas the Tank Engine or The Little Engine That Could. Locomotives fascinate boys of every age, and there are so many possibilities for a train motif. With a few tips, parents can pull off a train theme nursery or bedroom without derailing their budget. There’s certainly a wide array of wallpaper and paste on mural choices to complement train themes for a nursery or bedroom, but many parents opt for the less expensive coat of paint. Parents may want to scope out their bedding before settling on a foundation color for the walls. Once the walls are covered, parents can add a colorful train theme wallpaper border or use craft paints to add murals of train tracks, trains, crossing signals, a round house, and railroad crossing signs. Peel and stick wall decals are an equally attractive option. Posters are one of the most affordable ways to decorate the wall of a themed bedroom or nursery. Colorful posters of Thomas the Tank Engine and his friends will be a great accent for younger kids’ rooms. Older kids might enjoy livening up the walls with more realistic prints of locomotives. For parents who want to go all out with the train theme in their toddler’s bedroom, Little Tikes offers a Thomas the Tank Engine bed that can chug their little guy off to dream land each night. And of course, due to the popularity of these beds, they’re often available second hand for bargain hunters at yard sales, in local papers, or on Craig’s List. Kidsline offers their T is for Train bed set in cheery primary colors. Pottery Barn offers an Americana option with trains set against blue denim and red gingham. Of course, many parents and kids opt for sets featuring the familiar characters from Thomas the Tank Engine. Many of these bed and crib sets offer packages containing railroad theme bedspreads, sheets, bumper pads, curtains and even area rugs. For parents who save money and skip the theme furniture, these quilts and spreads are an equally attractive way to tie the room together. Toys are the easiest way to accent a railroad theme nursery or bedroom. Party supplies for train theme birthdays are another affordable source of railroad accents for the room. For children who are over the age of three, a train table can serve as great decor as well as providing hours of fun family play. Small items such as wooden train whistles, conductor’s hats, and bandanas can invite children to imagine themselves steaming down the tracks. Decorators can cheaply create themed furniture for a train bedroom, using superglue or screws to fasten a circuit of wooden track around the tops of the dresser, desk, or chest of drawers. Locomotives designed for the set can be positioned at intervals along the railway. Parents should of course keep manufacturers age limits in mind when decorating with toys in their baby’s or toddler’s nursery. Families that want to include an electric train set could install a narrow shelf along the room’s perimeter near the ceiling. Having the train up higher keeps it from getting derailed accidentally, adds depth to the room, and brings a little motion to fascinate babies and children of all ages. Parents can emphasize the classic train theme by framing pages from the well-loved storybook The Little Engine That Could and hanging them in sequence around the nursery. Used bookstores are bound to have several affordable copies of this time-honored treasure. Higher shelves are a great place to decorate with toy trains and storybooks. Parents can choose books such as ThePolar Express, The Little Engine That Could, Donald Duck’s Toy Train, or so many others and display them covers facing outward. Decorating with books is an inexpensive way parents can add accents to the train theme nursery and instill a love of reading early. Parents can personalize the room by taking a train ride with their child and snapping pictures at the station for a framed collage. Parents and kids can also snip illustrations from used train picture books to decoupage accent pieces for the room such as pencil cans, plaques for the wall, a table and chairs, or nightstand. Touches like these make a railroad theme room feel special and fill it with happy memories. 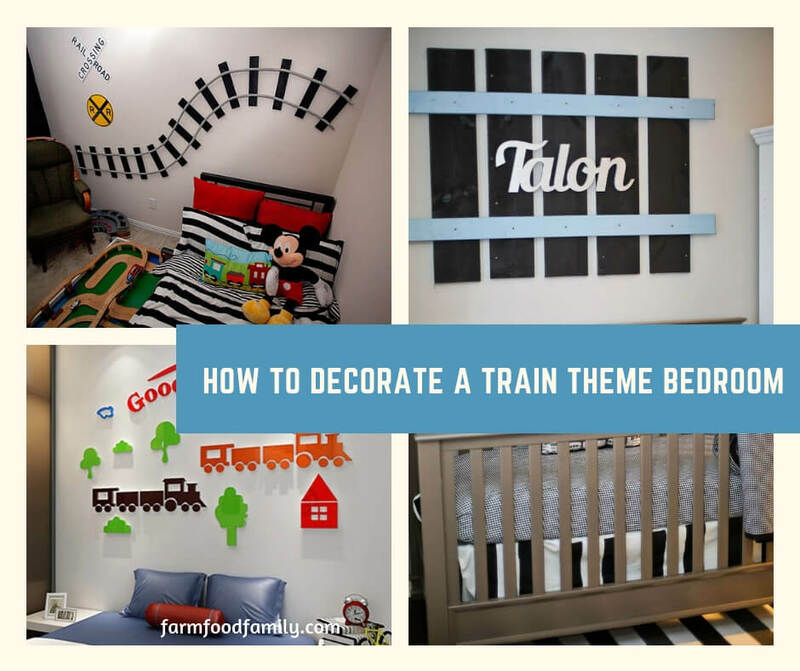 With these ideas decorators can keep their train theme bedroom or nursery project right on track. For other decorating tips, parents can check out articles on construction vehicle, airplane, and nautical or boat theme bedrooms.